One thing we’ve found to be a particularly rewarding weekend activity: writing singable worship songs based on the Psalms. I’ll share more on this soon, but in the meantime . . .
How blessed is the man; how blessed is the man. But the Lord knows the way of those who do what is right. Lovely! Are you working on a full bible like this? Thanks, Jean! Not sure if we’ll do every song in the Bible, but over the next few years I hope to at least put all the Psalms to music. Awesome! Do you have a particular plan on how to handle longer Psalms, such as highlighting key thoughts or splitting them up into multiple songs? Very nice but I think you will find some of the thought in some of the Psalms may not fit so well with our modern idea of worship. Accusing God of being asleep at the wheel as in Psalm 44 or asking God to break the arm of the wicked as David does in 10:15 do not fit in the set of most worship teams. I don’t think many of the Psalms get much love in Bible studies and church readings, and I expect that to be the case with some of the tracks in this project. Even as soon as Psalm 3 we get some material that just doesn’t jive all that well with the whole love-your-enemies teachings of Christ. It’s going to be rough handling some of the not-so-friendly Psalms. I realized this post is more than two years old, but wonder how things are going with the Psalms? 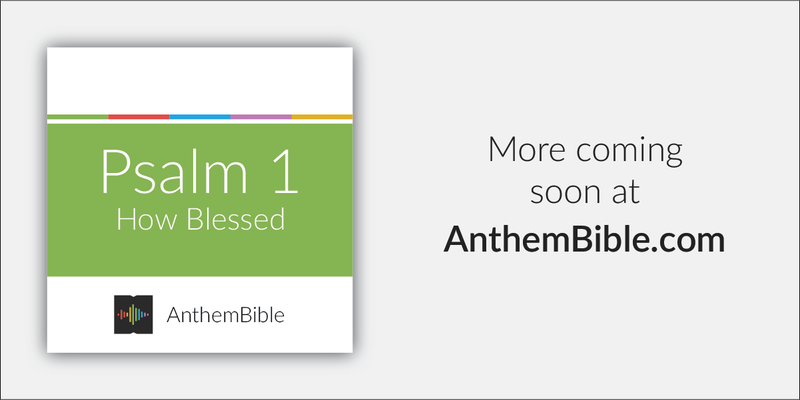 The Anthem Bible website cannot be found, according to my server. Thanks for sharing the first song! I enjoyed it.